Neal Berntsen joined the Pittsburgh Symphony Orchestra trumpet section in March 1997, having been appointed at the invitation of Music Director Lorin Maazel in 1996. He is a native of Tacoma, Washington. He began his musical studies at age five playing the violin under the tutelage of his mother. By age eight he advanced to the trumpet and ultimately received a B.M. from the University of Puget Sound and a M.M. from Northwestern University. 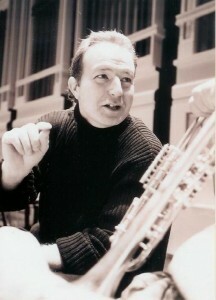 A former member of the Chicago Lyric Opera Orchestra and the Grant Park Symphony Orchestra, Neal has also performed as Principal trumpet for the Ravinia Festival Orchestra, Chicago Chamber Orchestra, Cincinatti Symphony Orchestra, San Diego Symphony Orchestra and the Bamberg Sinfoniker in Germany. Other orchestral performances have included the Chicago Symphony Orchestra, Boston Symphony Orchestra and Houston Symphony Orchestra. Active as a chamber musician, Neal is a member of the Pittsburgh Symphony Brass whose recordings, “BACH: THE ART OF FUGUE” (1998), “A CHRISTMAS CONCERT” (2000), “THE SPIRIT OF CHRISTMAS” (2003) and “A SONG OF CHRISTMAS” (2008) were described as “…Awhirl with color and rhythmic vitality – quite irresistible on every count.” by the Pittsburgh Post-Gazette. The recordings contain numerous arrangements by Neal Berntsen. Mr. Berntsen is also a founding member of the award-winning Asbury Brass Quintet, about which Fanfare magazine stated, “Not only expert but musical…undeniable virtuosity.” Mr. Berntsen has toured Japan with members of the Chicago Symphony brass section as the Chicago Brass Soloists. Neal Berntsen was a finalist in both the Maurice André International Trumpet Competition in Paris, France and the Ellsworth Smith International Trumpet Competition. His wide ranging discography includes The Orchestras of Pittsburgh, Boston and Chicago, Manheim Steamroller, The American Girl Doll Christmas album and Michael Jackson. .
As an educator, Mr. Berntsen is Chair of the Brass Division in the School of Music at Carnegie Mellon University. Mr. Berntsen also serves on the Faculty of Roosevelt University in Chicago. He previously served on the faculties of Duquesne University and Valparaiso University in Indiana. He has been published in The Instrumentalist magazine, and the International Trumpet Guild Journal. Neal Berntsen was involved in the editing of Luis E Loubriel’s book, “Back to Basics, The Teaching of Vincent Cichowicz” (Scholar Publications 2009) Mr. Berntsen was recently involved in the publication of Vincent Cichowicz Flow Studies Volume 1 (Studio 259 Productions 2013) and Volume 2 (Studio 259 Productions 2014) Additionally, Mr. Berntsen’s performance of the flow studies are contained in the CD’s released with the books. Mr. Berntsen has presented master classes and recitals around the world. In summer 2009, Neal Berntsen began an association with the Brevard Music Center in Brevard, North Carolina. Mr. Berntsen serves as Principal Trumpet for the Brevard Music Center Orchestra, performs chamber music, teaches trumpet and coaches chamber music at the festival. In the summer of 2015 Mr. Berntsen recorded THE ANCIENT CALL for micro-tonal trumpet and orchestra written by Iranian-American composer Reza Vali at The Brevard Festival. The world premier was conducted by Kieth Lockhart, Artistic Director of the Brevard Music Center. The piece incorporates the Persian Scale using quarter-tones. Mr. Berntsen performed the piece on a specially modified vintage Mt. Vernon Bach C Trumpet, which enabled him to execute the Persian quarter tone scale. Mr. Berntsen is an active studio musician and was featured on an award winning national series of commercials during the broadcast of the Olympic games in Atlanta. His performance on “America” sung by Diana Ross opened the women’s final tennis match of the US OPEN in Flushing Meadows New York. Neal Berntsen has studied with Adolph Herseth, Vincent Cichowicz and Manuel Laureano.